We are sharing personal stories written by individuals impacted by Myasthenia Gravis. Today’s post is written by WWMG member, Elizabeth Hudson. Elizabeth (left) right before her diagnosis. Trying so hard to smile and look happy, but physically unable to smile normally. It all started when I was 16 years old, about to start my junior year of high school. I woke up in the middle of the night with what I can only describe as the most blinding and excruciating pain I’d ever felt. I couldn’t put my finger on where the pain was coming from – I just remember my survival instincts kicking in because I felt like I was going to die. I crawled into the closest room to my bedroom, which was the bathroom. My parents’ room was across the house, and I couldn’t muster any strength to scream or crawl that far. I remember half crawling, half staggering in the bathroom and hitting my head on the window, my lip splitting open. I started grabbing for whatever I could, and although it’s blurry, I remember turning the tub on full blast and turning it to as cold as it would get and sticking my head underneath the water. I was trying to shock my body into staying alive as long as possible. Think I’m crazy? I don’t blame you. My parents probably did when they woke up and found the bathroom completely ram sacked, shampoo and bath bottles all over the bathroom, and most alarmingly, the faucet from the tub completely yanked out of the wall, and barely hanging on and dangling from the shower wall’s ceramic tile. I tried to describe to them what happened to me, but couldn’t find the words, since I didn’t even have any idea what had happened to me. They thought about getting a CAT scan done, but the event blew over and I’m sure they quietly hoped we could all just act like such a crazy thing never happened. Cut to three years later, when I was a sophomore in college. Ever since the incident I described that night, I started to experience changes in my mind and body which I can’t explain. It started out as constant, unbearable fatigue and eventually my speech started becoming slurred. Sometimes it was extremely bad; sometimes I could speak clearly. I knew what message my brain wanted to say, and my mouth knew how to say them as it had my whole life, but the two couldn’t seem to make the connection. Other strange instances started happening, and I had extreme trouble swallowing and chewing my food, which made the once enjoyable pastime of eating seem like a chore and draining workout. I would become extremely out of breath trying to do something as simple as sing along with a song in the car, and would lose my voice without having exerted my vocal cords. One night while sitting on the couch watching TV, I tried to make my hand into a fist and unclench my fingers. My hand couldn’t do it. My brain sent the message, but my hand wasn’t responding. I felt like a prisoner in my own body and was utterly confused and scared. I told my Mom, who was baffled and suggested it might be carpel tunnel. The strange instances kept happening – one night at my college’s Rec center, my friend convinced me to work out with her. I took it easy on the elliptical, and suddenly felt I urgently needed to take a break. When I stepped off the machine, my legs collapsed, and I couldn’t find strength in them to get back up for about two minutes (I tried to be smooth make it like I was purposely stretching, since there was a group of young guys on the machines behind me). When my legs finally regained strength, I drank water and told myself I hadn’t eaten enough, but in the back of my mind I knew better. Similar instances happened when I tried to go out with my friends and my legs completely gave out underneath me. Around this time I was in a public speaking class, which stressed me out to no end. My roommate was in the class with me, and we decided to go on a morning jog to ease nerves before our crucial final presentations. The night before, I was practicing my speech out loud, and my words kept slurring. I told myself it was all in my head and just nerves – besides, I had no other option and this was our final grade. As I stepped up to the podium to give my presentation, I barely got about three words out before my speech was slurring so badly it was absolutely and utterly incomprehensible. In shock, I skipped to the last line of my report, which was inaudible due to the severe slurring of my speech. I was supposed to speak for seven minutes, but numbly folded my paper up and returned to my seat. The class was in shock, and you could hear a pin drop. It’s a blur, but I’m pretty sure I tried to make a lame joke out of it. I talked to my professor after class and told her in the midst of tears that I didn’t know what was going on, and she worked with me to get a mediocre enough grade to pass. Not long after this, I was driving and looked down to realize I saw two speedometers. I had extreme double vision out of nowhere. I visited an eye doctor, and he was as confused as I was and gave me some eye drops. Soon, the severity of the double vision became overwhelming, and even with my contacts, everything looked like an incomprehensible blur. My eyelids started drooping, and one eventually shut all the way. Finally, I began to lose control of my eye movement. Instead of holding still, my eyes would move around randomly against my will and also become paralyzed and freeze into place before randomly drifting again. Yes, this was as creepy as it sounds, and finally prompted me to go to the ER. As soon as they took one look at me, I could tell by their expressions that it was serious and they immediately made plans for me to be admitted in the hospital. So began a three or four day extravaganza of about every test you could think of. I felt like a lab experiment and like I was a prisoner of my own body. I underwent Spinal taps, CAT scans, MRI’s, and was poked and prodded more times than I can count. Curious medical residents surrounded my bed daily, scribbling furiously on their clipboards and with glints of excitement in their eyes, taking pictures of me, and I remember thinking I was at least entertaining and teaching someone something. I was scared, in shock, and the entire experience was surreal and a blur. Finally, on my third or fourth day in the hospital, a neuro-ophthalmologist sauntered in my room, fresh off of a life-saving brain surgery from a patient who was in a severe car accident. He plopped down in the chair next to my bed and gave me the size-up I’m so used to seeing. He scribbled a few things down. That was the beginning of my story, and unfortunately I can tell you no ending. Since that time, my life has been a mystery of what will happen next, and a rollercoaster of health scares, good days, and horrible days. The doctors put me on prednisone, Mestinon, and Imuran after I was diagnosed. I medically withdrew from all of my classes that required physical exertion and speaking (which was a problem since I was a communications major). As I went to the office to get my waiver signed for my medical withdrawal from my classes, I will never forget the look on the face of the woman who was working as she squinted her eyes at me and looked me up and down. By this time, my medication had kicked into fix my eyes and facial muscles. “You look fine,” she spat at me. “I think you’re just lazy and want to get rid of the classes you don’t feel like taking. I’ve had students do this before.” I stared back at her in complete disbelief. This was my first lesson, and a huge reason as to why I went many years not telling people about my MG. It’s an invisible disease. People will judge you, calling you lazy and telling you it’s all in your head, because they are ignorant and uneducated. That’s one reason why awareness is so incredibly important. I moved back home away from college, and kept up with my remaining classes through 50% determination and stubbornness, and 50% internet and email. To take finals, I was forced to drive back to my campus about an hour and a half away. I stayed overnight in my apartment and woke up the day I was supposed to take my finals running a fever and in pain, and with a strange feeling that I can’t describe – the only thing I can say is I felt with every fiber of my being like I was dying. I called my doctor who told me to get to the ER immediately. It’s all a blur, but they admitted me in the hospital and found that the Imuran (an immunosuppressant) medication I’d been taking had nearly wiped out my white blood count. I was in the hospital for about a week, and it was one of the most frightening and life changing experiences I’ve had since my diagnosis. My doctor told me that if my white blood count didn’t start to boost from neupogen shots they were giving me, that they would have to do a bone marrow test for cancer. I didn’t sleep much that night, and I felt very alone, frightened, and angry. I remember making a promise to myself that if I did not have cancer, I would start making changes in my life for the better. Fortunately I responded to the neupogen shots and my blood count boosted. I administered the shots to myself for the next few months and spent the summer in isolation because I couldn’t be around crowds of people due to the danger it would put my fragile immune system through. Since then, it has been 5+ years of ups and downs, highs and lows. I have no choice but to have no fear of the unknown and face whatever comes to me head on. I have been on prednisone and mestinon since I was diagnosed, and have never come close to having control over my MG or being in remission. 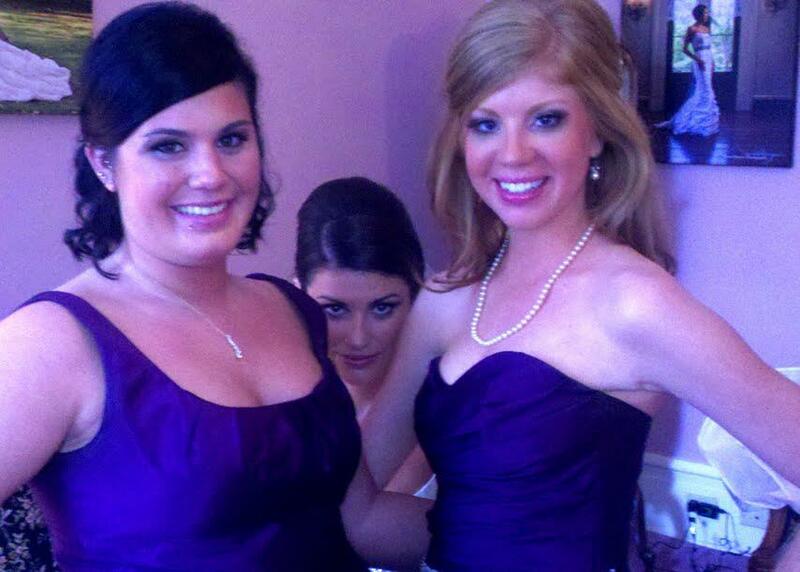 I have, however, become good at hiding it and leading what I want so badly to be a “normal” life for a young woman. I have gotten consistent IVIG treatments for the past four years, varying from every two to four weeks. These are 6+ hour long infusions which have taken up many of my Saturdays from the ages of 20 to now (I just turned 26), when I can think of a million things I’d rather be doing and experiencing. I was able to graduate college although I had many missed classes and several hospitalizations and flare ups. I worked with my teachers and even was able to do an internship with a Congressman on Capitol Hill in DC, which I received a scholarship for in part because of an essay I wrote with described the resilience my MG had given me. I like DC so much that I moved here and am able to work full time, although I spend most of my spare time resting and sleeping so I can save enough energy to do one or two social things a week. My doctor consistently tells me the dangers of being on prednisone for such a long period, but my only other options are immunosuppressant drugs such as Imuran and Cellcept, which can heighten one’s risk for cancer, and which I have consistently had horrible and life threatening reactions to. It seems to be a lose-lose situation, and I usually take it day by day. Effects from my MG and the medications I take for it have caused me to have depression and severe anxiety. Throughout college, I lived in a constant state of panic that the teacher would call on me and that I would slur my speech or have breathing and swallowing problems if I tried to speak. Public speaking was a nightmare, and while I used to love speaking out and giving my opinion in groups, MG took away that joy from me and made it terrifying. I try to keep anxiety medication to a minimum since I want to be on as little medication as possible, but the side effects of my prednisone and anxiety and fear of more breathing crises make it hard to handle. I used to think of anxiety as a mind over matter issue, but now I see how deeply the mind and body are connected. But if having MG has taught me anything, it’s that it’s not what happens to you in life that makes you who you are – it’s how you deal with it. I refuse to be a prisoner of my own body and let it control me. It knocks me down, but I always fight back. Last summer, I had a huge wakeup call when I was walking home from work in the 100 degree heat (Heat greatly exacerbates MG). I got home, and laid down flat on my back to rest to try to cure the desperate fatigue I felt. As soon as I lay down, I tried to catch my breath and the breath never came. My breathing muscles froze up and it felt like I was drowning. I sat straight up and in a haze, heard myself involuntarily making gasping, sputtering noises for air. My hands were shaking but I managed to reach for my mestinon and choked one down before calling 911 and crawling into the living room of my apartment, where fortunately my roommate was. The 911 operator couldn’t understand me and neither could my roommate, but after a couple of minutes I started to slowly regain my breath. “Umm, do you still need an ambulance?” the confused 911 operater asked me. In a state of shock, I hung up the phone and threw it down and started sobbing, before regaining my composure to call my sister, who is a nurse. She noted that I could barely get out two words without being out of breath, and so I called a cab to the ER. The ER personnel were unfamiliar with MG and I waited for about 5 hours, crying most of the time because I was so scared I would lose my breath again. They kept me overnight, administering tests which rendered unhelpful. I felt more alone than ever, and it was probably one of the worst nights of my life because of how utterly helpless I felt and because the reality of my situation was starting to hit me. It can be a helpless feeling to know that you desperately need help and no one seems to understand what you are going through. I have tried working with many alternative doctors and several neurologists, but my MG keeps persisting and is showing no signs of improvement. The only thing that seems to be controlling my MG it is the prednisone, which will hurt me as much as my MG if I keep taking it. IVIG treatments help less and less the more I get them. I am hopeful that in my lifetime there will be an effective treatment or a cure, but as for now I’m living day by day not knowing what lies ahead of me. Some days are fine, and some are a struggle, which makes it even harder for those around me to understand, and I’m fairly certain they think it’s in my head when I am having a bad day. But I no longer let that affect me. The longer I have MG and the more I experience, the more vocal I am about my MG because I am realizing how direly me and others like me deserve a better life and a better solution than what we have right now. I will never forget the woman who sneered at me when I handed her my medical form for my requested leave in college after my diagnosis. When she spoke down to me as if I was lying and crazy because of the fact that she looked at me and didn’t see a disability, I felt weak and utterly helpless and left feeling ashamed. After my second hospitalization, I visited the office again and told them about the unfair judgment the woman passed on me, and soon after received a voice mail from her asking how I was. I wish I would have returned her call, but I never did. Consider this my call out to anyone who has ever passed judgment on someone else without understanding what they are going through, and for everyone who has been through a similar struggle as I have. Hopefully my story will help prevent more unfair judgment due to lack of awareness, and hopefully it will let someone out there with MG or a related disorder know that they’re not alone. No one else is going to fight my fight for me, and as long as I have a voice left in me and MG still exists, I’m not ever going to keep quiet again. A recent photo of Elizabeth (right). Her smile and facial muscles are working, as long as she stays rested and keeps up with her treatments and medication. She does still have to make an effort to hold her eyes extra wide open in photographs, to avoid them looking droopy. I believe that Elizabeth did a fantastic job of describing what life is like with MG. Reading her story of her early symptoms almost felt like a flashback to myself at that age. But I waited far longer (over a decade longer) for an accurate diagnosis. I do believe that our awareness efforts are making a difference. But we still have a long way to go, in terms of awareness and treatment. Please consider sharing Elizabeth’s story with others. You never know when one person who reads it, might be the next person handed a slip regarding the medical needs of someone with MG. Perhaps they will remember Elizabeth’s story, and respond with more understanding than MG patients typically receive. Wow! What an AMAZING & COURAGEOUS young lady! We’re so proud of you for so many reasons, not least of which is how you’ve handled MG. Your story brought back so many memories of your journey, and I found myself reading each incident and thinking, “If only we…”. Awareness is so important, as well as research to find better treatment options a and a cure. Love you bunches!! Thanks everyone for sharing! I also forgot to clarify in my story that in the opening paragraph, I was having a breathing crisis pre-diagnosis without knowing what was going on. Thanks again for all the shares and positive input! Elizabeth, My wife and daughter and I read your MG Walk page with great interest. If you send me an email, I will forward it to Mary Beth Snow, asking her to forward your email to her daughter Jasmine, age 28, fashion assistant, and later accesories editor at Seventeen Magazine in New York City, diagnosed with MG during her first year at The Fashion Institute of Technology. (I don’t want to share Mary Beth’s email address without her permission) They spoke at the MGFA annual conference in Miami in May 2013. At that point they had raised over $150,000 toward finding a cure. We’ll ask Jasmine to read your MG Walk page and get back to you. What a brave young woman you are. Thanks for sharing your story with us because it really helps to know you are NOT alone. God Bless you honey…. Thank you for your inspiring MG story. 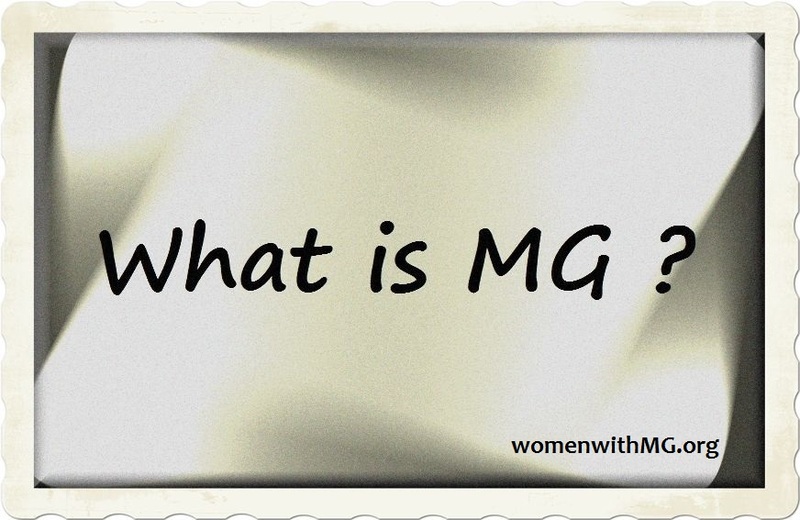 I have had MG for a little over 21 yrs, since I was 27. You have been very courageous and forthright in your sharing. I know you will, and have helped countless others. I read Elizabeth’s story and could identify exactly with all the mysterious symptoms similar to hers that I also had when I was 38 (7 yrs ago), diagnosed a few months later with MG. Elizabeth, you are so amazing in your courage, and inspire us all! So true what Elizabeth says about MG being the silent disease. My symptoms have never been below the neck, but at one point I could not even swallow water and after begging for IVIG, finally got it and it was like a miracle. However, I know that MG is not something that goes away, I get flare ups especially with stress, and have committed to azathioprine for life. I really want to get more involved in the cause, and will be following the website more in the near future. My best wishes to all who have MG and to their supportive families.